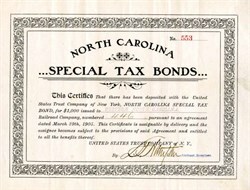 Certificate from the United States Trust Company for North Carolina Special Tax Bonds issued in 1905. The certificate was issued to the Western North Carolina Railroad Company. This historic document was printed by the American Banknote Company and has an ornate border around. This item has been hand signed by an officer. The recent decision of the Supreme Court of the United States, entitled "South-Dakota vs. North Carolina," wherein the former state secured a judgment against the latter on ten bonds, par value, $10,000, amounting with interest to $27,400 (which has just been paid) has greatly enhanced the value of all other repudiated state bonds, because it has established the law and the procedure by which they can be enforced. The undersigned committee, in 1901 pooled all of one issue of North Carolina bonds and originated the plan by which the above successful results were brought about, and obtained a settlement for the individual bondholders, at a little less than par, of their entire holdings of these bonds. This committee is now ready to proceed with the collection of all other repudiated bonds of every class, of each state. This committee has no connection with any other committee, and it knows that it alone is now in a position to avail itself of the benefits of the above mentioned decision. Those who desire to enforce the collection of their bonds will deposit the same with the North American Trust Company, 195 Broadway, New York City, and receive receipts therefor and a contract agreement under which the undersigned committee will undertake to collect the same. W. N. Coler & CO., R. F. Pettigrew, D. L. Russell, Marion Butler.